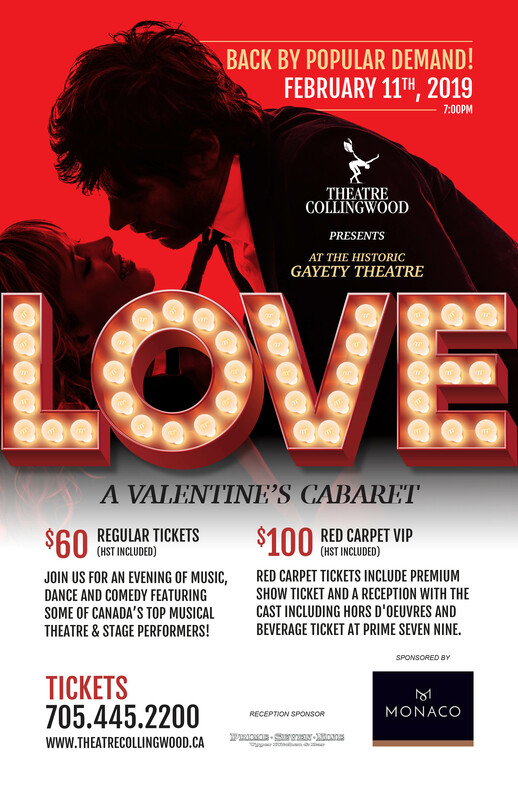 Monaco Classic Condominiums is proud to sponsor an evening of outstanding entertainment featuring some of Canada’s top singers and musicians in Theatre Collingwood’s LOVE Cabaret. It’s the 5th Anniversary of this popular fundraiser that sells out each year. So, gather your friends and join us Monday, February 11th at the Historic Gayety Theatre for this wonderful celebration, just in time for Valentines Day. RED CARPET VIP guests receive premium seating for the show and entrance to the after-party at Collingwood’s hottest new restaurant, PRIME SEVEN NINE.